Fantastic choice! I can’t believe I didn’t think of it myself! 😀 Lizzie was so relatable in this, which made even the draggy episodes interesting for me. And I love all the gifs you found! Thanks! I usually don’t go GIF crazy but with LBD, it was hard not to! And I agree, Lizze is very relatable and so fun! Costume theatre! Yes, definitely love when they do that! I’m excited about Emma too! I started reading this last night, but part of me zoned out as soon as I saw the words “Pride and Prejudice,” so I didn’t finish. Read it this morning and I’m mildly intrigued. For me? First season (and still carries into the 2nd a bit, but the first was where it was strongest in the comparison) of Revenge (The Count of Monte Cristo). Good times. Very close runner up? West Side Story (Romeo and Juliet). Both have areas that they stray a little bit, but the similarities are striking. Also, I recognized Lizzie, looked her up, and she played board games with Wil Wheaton on Tabletop. I strongly approve of Tabletop. Ashley Clements is awesome and a true geek. I follow her on Instagram and she clearly loves her some Star Trek. I think you would actually like at least some of the episodes of this… It’s very quirky and clever. Yeah, when I find some time I might start working through it. 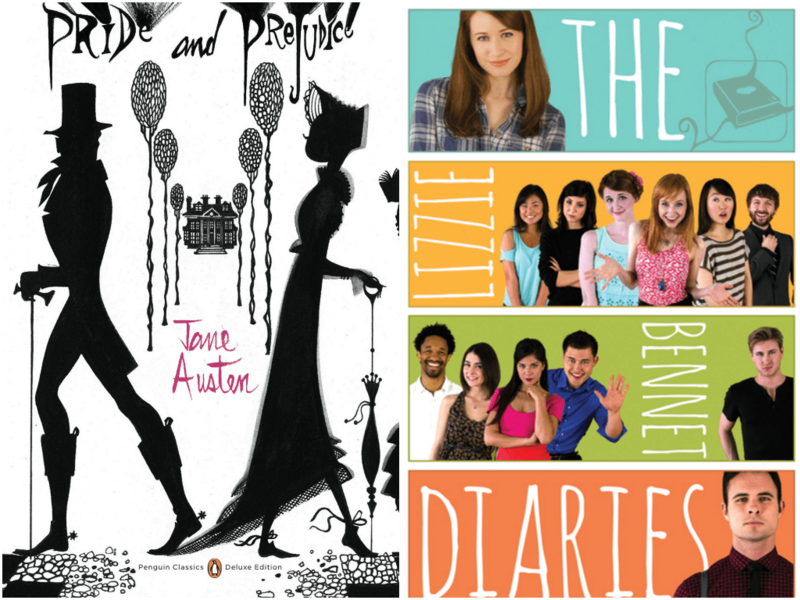 I’m about half way through the lizzie bennet diaries and I love it. I think it is one of the best modern adaptations of victorian literature that I’ve seen. They did such a great job with taking the classic elements and changing them to a modern setting, while still maintaining the sprit of the story. Right it’s hard to take a book that depends on the fact that women must marry for economic security and adapt it for the 2000s. I think also telling it through modern platforms (youtube, tumblr, twitter, etc.) helped. I have watch a bit of it…still haven’t finish it but I’ve enjoyed what I’ve watched. I kinda wish it was in a video podcast format…that would be so much more convenient. That would be nice! Then there is no telling how many times I would have rewatched (or mostly just reheard) it since I am always listening to podcasts at work! Later in the series too I feel like they drag out some of the story lines, but it’s definitely nice when things finally pick up when Darcy finally appears! The Lizzie Bennet Diaries is sooo cute. I remember when I watched the first episode– it was in the morning and I kept watching ’till eight pm. Lizzie is such of a relateable character (and funny) and the rest of the characters perfectly capture the essence of the certain character they are based on. I just can’t wait to see what they can do with Emma Approved! I watched every episode that was available up to that point in one day… Thankfully it was some minor holiday I was off work for! I don’t remember how many it was up to, but it was definitely over 50.